The Shoreline Community College’s Volleyball Team dominated the NWAACC Northern Region “Players of the Week” for “Week 8″ of the season. SCC middle blocker Emily Denham was voted as the Offensive Player of the Week, Dolphin setter Jayln Anderson was the Setter of the Week and Shoreline’s Libero, Elena Estrada, was named Defensive Player of the Week. Denham, a sophomore from Meadowdale High School had 28 kills in two combined matches (3-1 victories over Edmonds CC and Skagit Valley College) with 3 solo blocks, 2 block assists, 24 digs and 5 service aces. Anderson, a sophomore from Kamiak High School in Mukilteo, WA had 53 assists in those two games with 3 service aces and 14 digs. 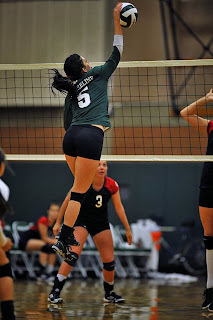 Estrada, another sophomore, from Cascade High School in Everett, WA had 33 digs from her defensive specialty position. The Lady Dolphins are 19-11 on the season, 6-2 in the NWAACC Northern Region and play at Bellevue College on Wednesday. Bellevue is tied with Olympic College for first place in the region, with a 7-1 region record and an overall record of 23-5 and are ranked 4th in the NWAACC.